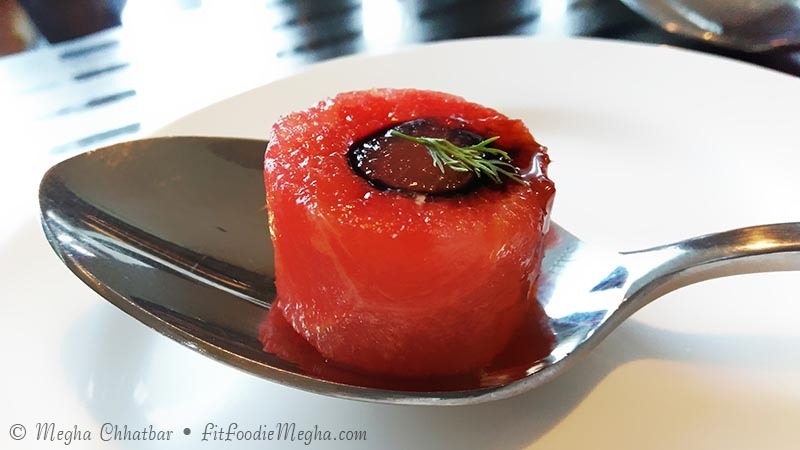 Fit Foodie Megha: Syrakko - Fine Dining concept redefined - Reviewed! 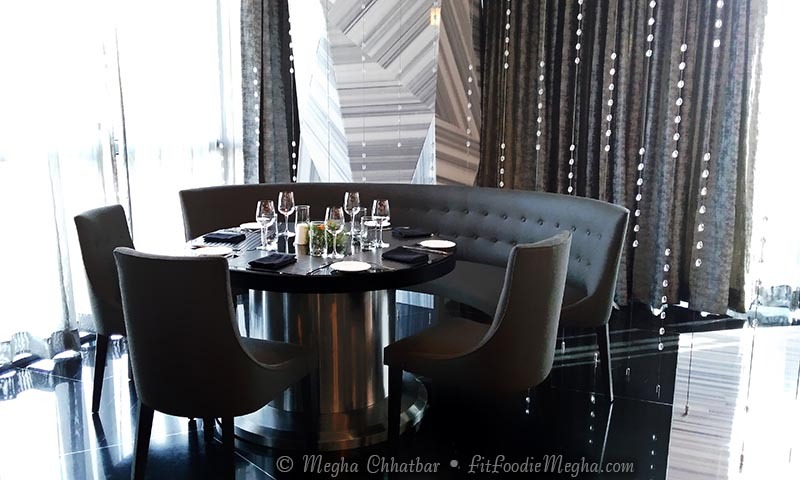 Syrakko - Fine Dining concept redefined - Reviewed! 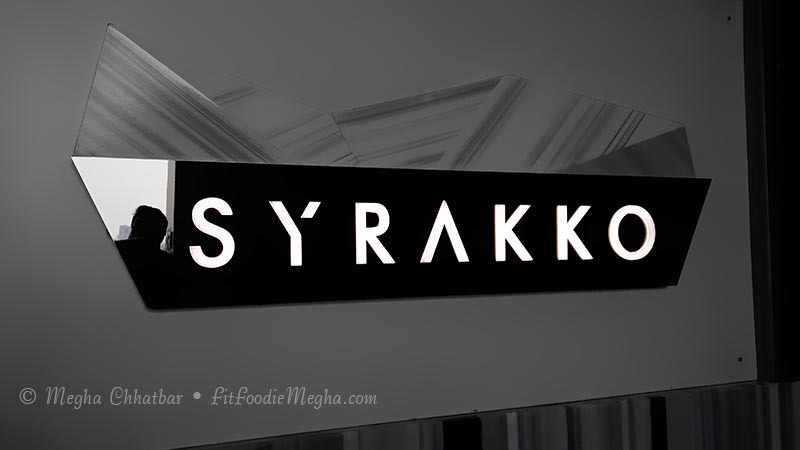 Syrakko is one of the many restaurants offering perfect fine dine experience. They have managed to tick all the essentials of fine dine. I have no idea, why they have taken so long to launch. 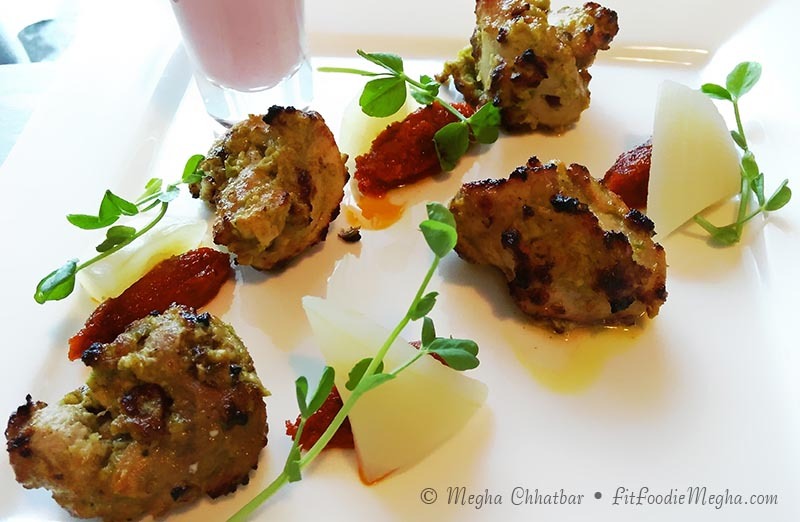 Chef Nagraj has been looking after the kitchen and menu for which he is proud of doing fusions. Menu is not that extensive and Chef has tried to keep basic recipe same while adding the twist. I have been here twice and experience was always pleasant. Location: Located on 7th Floor, Kapila Matrix, Koregaon Park Annex, Mundhwa, Pune, it is easy to find. The Building is a hub for multiple restaurants and best choice for fine dine is Syrakko. The city lights and view is mind blowing. Ample parking space in the basement. Ambience: Shades of grey make this place classy. Soft lighting and soothing music worked for me. Comfortable Sofas and elegant cutleries making it a memorable experience. 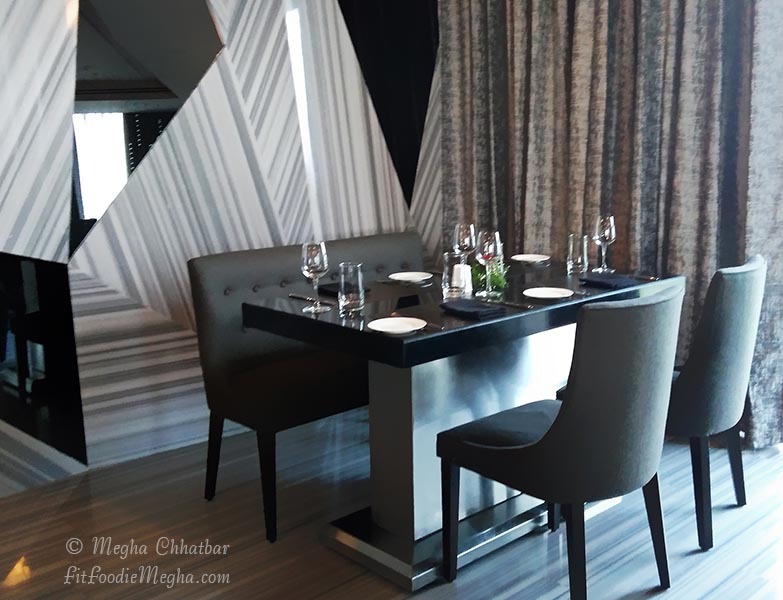 Dining experience is importantly related to Food and Ambience and trust me nothing was compromised on. We started with Spiced Coconut and Oriental Vegetables Broth (Rs. 250) with roasted cashew-nuts, garlic flakes accompanied by garlic melbo. 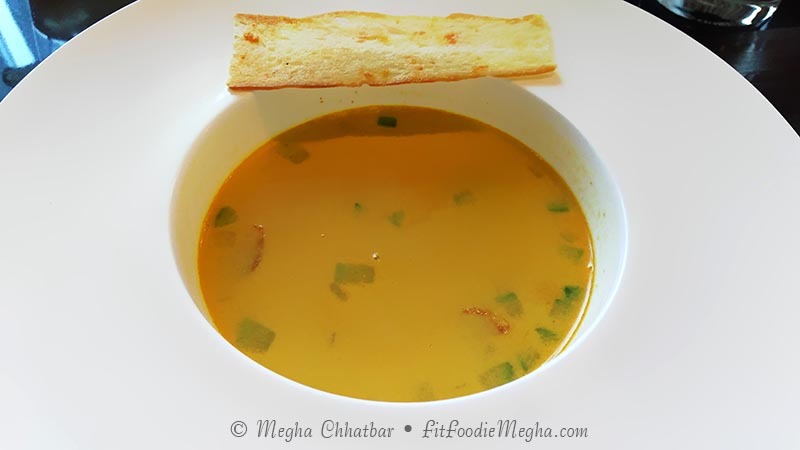 Broth was fragrant with pleasant aroma and tasted best with melbo. It was highly appetizing. 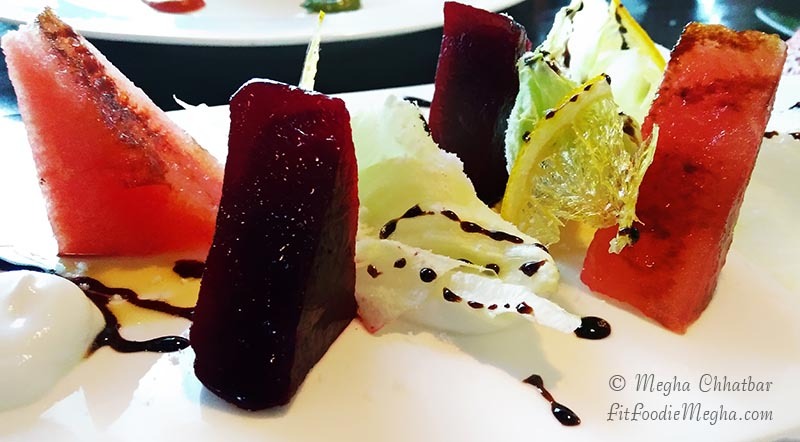 Pickled Beetroot and Feta Mousse Salad (Rs. 280) is a famous house salad.served with orange crisps, watermelon, olive oil powder and drizzled with balsamic reduction. I found the portion to be less though the taste was refreshing. Bit tangy and sweet. 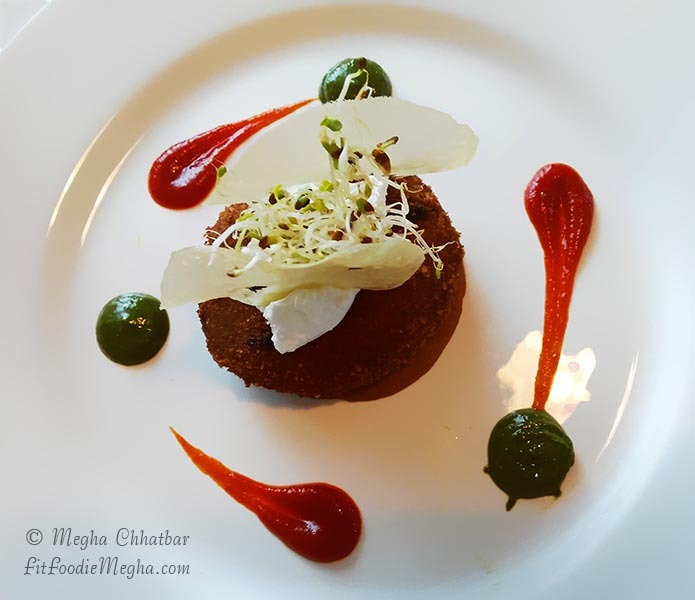 Ragda Pattice is given a twist to pea tikki stuffed with beetroot and balsamic chutney in the form of Peas Escalope (Rs. 260). Crispy patty is served with refried bean hummus and sour cream. Blue Cheese and Spinach Tagliatelle (Rs. 390) is a rich, creamy blue cheese preparation with cheese and almond. 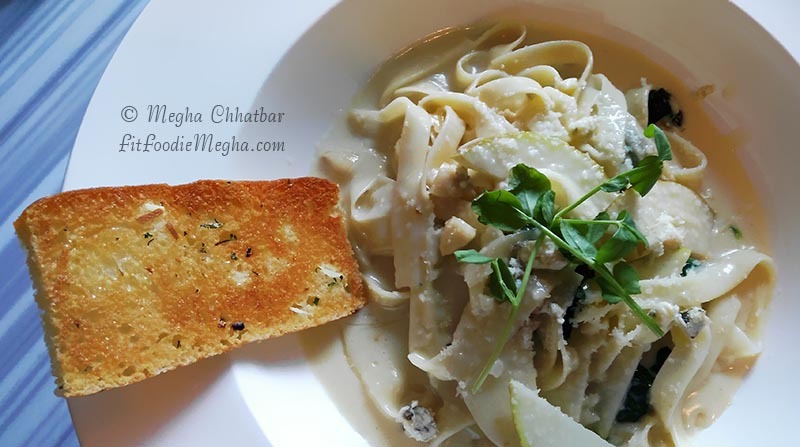 Tagliatelle is tossed in creamy sauce and the flavours just bursts in mouth with every portion. Highly recommended! Pan Asian Ravioli (Rs. 390) is given an Asian twist with Tofu, water chestnut and shitake is stuffed in the Ravioli and tossed in black beans and scallion sauce. It was an average affair as for me this twist did not work well alike other dishes. 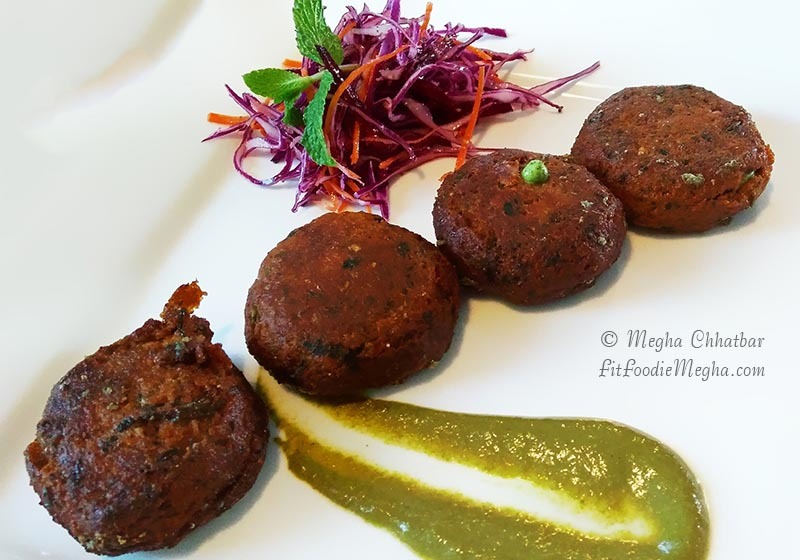 Khubani Kofta Curry (Rs. 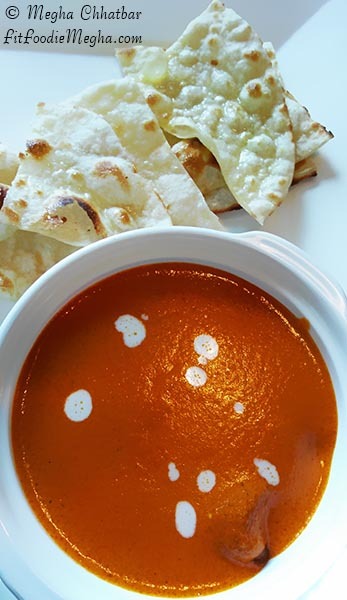 390) Apricot stuffed Cottage Cheese dumplings in rich, creamy, mildly spiced tomato fondue. 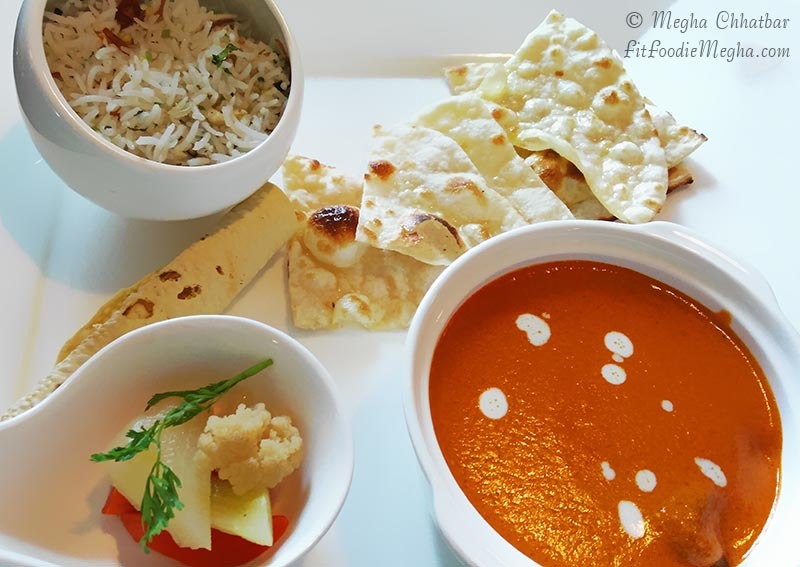 Curry was accompanied with dry fruit pilaf and naan enough for a person. The taste of apricot kofta in curry lingers in your mouth till the end. Beautiful presentation. Highly Recommended! 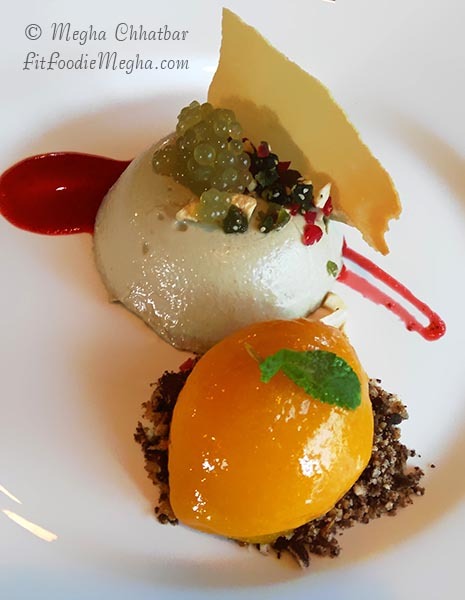 Paan Pannacotta (Rs. 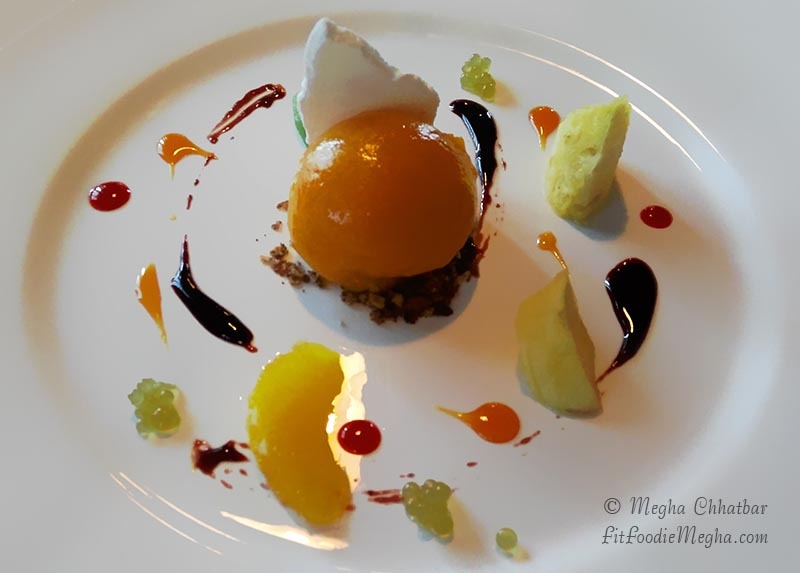 290) - Beetle leaf twist in Pannacotta!? Interesting. 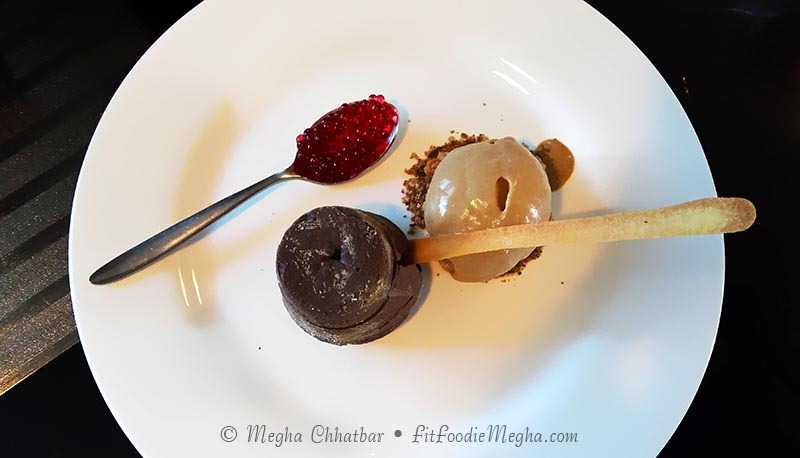 It surely had paan flavour with fruit coulis and raspberry pearls. 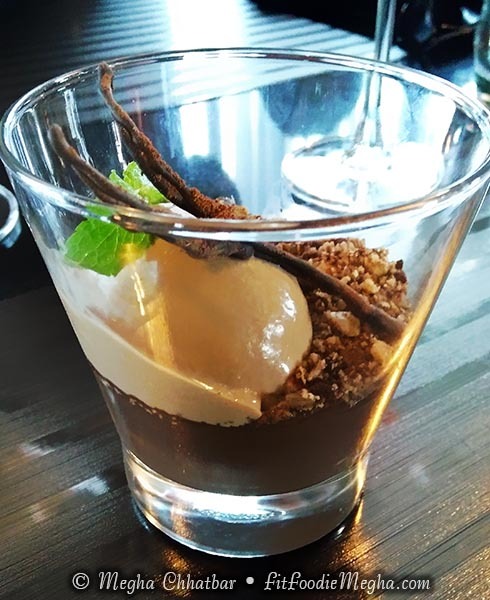 Salted Chocolate Mousse (Rs. 290) Decadent dark chocolate was used and who doesn't like it. Nice presentation with Malibu soup on and angel's sponge. Bit on the sweeter side though. Espresso Phirni (Rs. 250) Phirni in combination with Espresso was a hit! Mild flavour of coffee with tiramisu granila and chocolate soil surely won my heart. 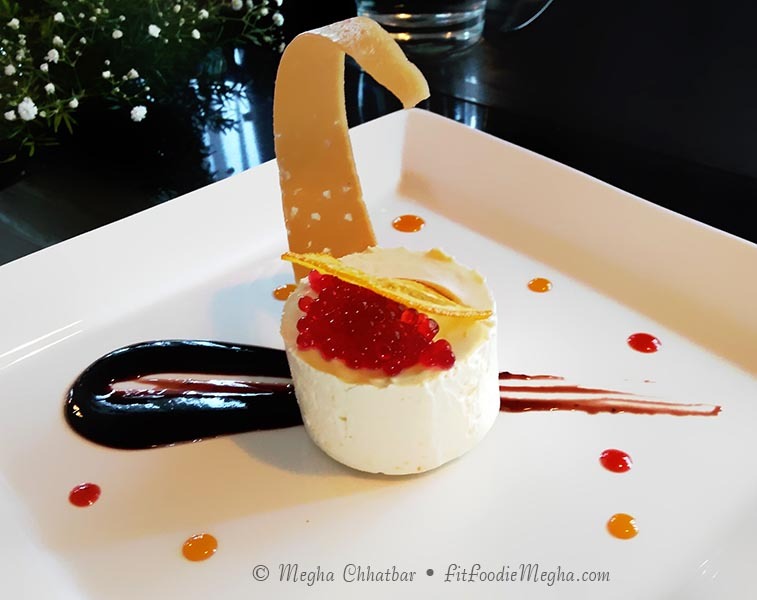 Fresh Fruit Sorbet and White Chocolate and Wasabi Parfait had a standard taste but I was happy with the Phirni and my cravings for desserts were satisfied with it. Staff and Service: Staff was knowledgeable and quick. Service oriented. Two hits for non vegetarians were Lamb Shami Kebab and Murgh Thecha Kebab. Below are the pictures.. Overall my experience was a memorable one. Every nook and corner of the restaurant is planned and taken care of. Menu is worked upon and few more dishes are in the process of adding. Do visit and share your opinions and views in the comment below.